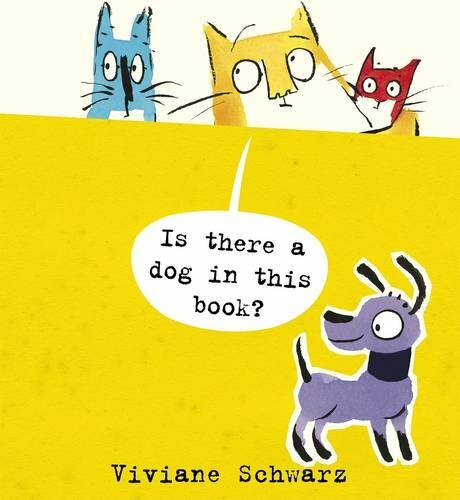 Fans of Viviane Schwarz' two books featuring her cats, Tiny, Moonpie and Andre, will be delighted to see them back. Nor have they lost any of their playfulness. However, this time they are not alone - there is an intruder in their world. Surely not? Is there a dog in this book? Well, yes there is. Following the format established in the previous books, young readers are invited to interact with the cats who speak directly to them, blurring the lines between the book as an object to be looked at and the story as something to inhabit. There are doors to open, boxes to peer into and intriguing pages to turn. Throughout there is the delicious sense of a game of hide and seek. This is enhanced by Schwarz's distinctive style in which every line has an energy and drama of its own. Above all there are the cats, colourful and full of character - and now there is a dog as well. Fantastic!